Arthur Tooth & Sons, Ltd., London. The Hon. Mrs. A.E. Pleydell-Bouverie, London. Eugene Thaw & Co., New York. British Rail Pension Fund Collection; sale, Sotheby's, London, 19 June 1990, lot 14 (acquired by the present owner). D. Cooper, "Some Exhibitions of French Art," Burlington Magazine, vol. XCI, London, 1949, p. 323. G. Jedlicka, Neue Zrichzeil, June 1949, (illustrated). E. Nestor-Samlyo, Die Kunst, 1949, p. 204 (illustrated). M. Zahar, Bulletin Les Amis de Gustave Courbet, no. 6, Paris, 1949, p. 2 (illustrated on cover). G. Mack, Gustave Courbet, New York, 1951, p. 154 (illustrated, pl. 31). R. Fernier, Gustave Courbet, Peintre de l'Art Vivant, Paris, 1969, p. 17, no. 4 (illustrated). R. Fernier, La vie et l'oeuvre de Gustave Courbet: Catalogue raisonn, Lausanne, 1978, vol. II (Peintures: 1866-1877, Dessins, Sculptures), p. 144, no. 803 (illustrated, p. 145; dated 1872). K. Herding, "Review of R. Fernier, La vie et l'oeuvre de Gustave Courbet: Catalogue raisonn," Pantheon, vol. XXXIX, 1981, p. 286. P. Courthion, Courbet, Paris, 1985, p. 118, no. 806 (illustrated). J.-J. Fernier, J.-L. Mayaud and P. le Noune, Courbet et Ornans, Paris, 1989, p. 57 (illustrated). Sarah Faunce will include this painting in her forthcoming critical catalogue of the works of Gustave Courbet. Paris, Galerie Alfred Daber, Courbet, Exposition du 130 Anniversaire de sa Naissance, June-July 1949, no. 7 (illustrated). London, Tate Gallery, The Pleydell-Bouverie Collection, January-April 1954, no. 12. Paris, Petit Palais, Gustave Courbet, January-February 1955, no. 37 (illustrated, pl. 28). Philadelphia, Museum of Art, and Boston, Museum of Fine Arts, Gustave Courbet, December 1959-April 1960, p. 64, no. 30 (illustrated). London, Marlborough Fine Art, Ltd., French Landscapes, October-December 1961, no. 13 (illustrated). Paris, Grand Palais, and London, Royal Academy of Arts, Gustave Courbet, October 1977-March 1978, p. 136, no. 56 (illustrated). Edinburgh, National Gallery of Scotland, Lighting up the Landscape, August-October 1986, no. 79. Brooklyn, Museum of Art, and Minneapolis, Institute of Arts, Courbet Reconsidered, November 1988-April 1989, no. 26 (illustrated in color, p. 126). 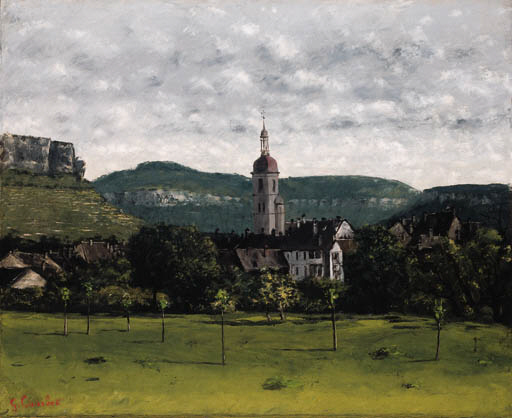 Vue d'Ornans et son clocher is a portrait of Courbet's hometown in the Franche-Comte. Throughout his lifetime Courbet identified strongly with Ornans and saw the natural beauty and native culture of the region as ideal models for reform in France; some of his closest associates, such as Buchon and Proudhon, shared and encouraged these sentiments. Vue d'Ornans et son clocher is a key image in Courbet's output, and it gives perfect expression to both his social and artistic ideas. From the beginning of his career, Courbet derived major themes in his work from the study of Ornans and its citizens. Indeed, part of the initial shock of Courbet's imagery was that he chose to depict the common people and rituals of his hometown on a monumental scale that previously had been reserved for the grand themes of history painting. Un enterrement Ornans, 1849 (Fernier, no. 91), and Les paysans de Flagey revenant de la Foire, 1850 (Fernier, no. 107) are two notable examples of this. In the course of the 1850s, however, Courbet turned increasingly to landscape painting, rather than figural works, as the primary means for expressing his ideals. For these pictures he normally selected scenes from the environs of Ornans; as a hunter and landowner, he identified intensely with the region, and he found immense inspiration in the distinctive features of its natural and wild beauty, such as the rough and irregular outcrops of Jurassic limestone, and les puits noirs and other characteristic aspects of the Loue river. His love for landscape painting was so great that in L'atelier, (Fernier, no. 165), his extraordinary self-portrait and manifesto of artistic ideals from 1855, he depicted himself painting a view of the Loue near Ornans (fig. 1). Whether we want to or not, we must think about abandoning the cities. Providence seems to have charged landscape painters with preparing us for this event by familiarizing and reconciling us with the countryside, man's natural home (quoted in J. Rubin, Courbet, London, 1997, p. 229). Courbet's picture corresponded to this sentiment. Indeed, in his review of the Salon of 1861, Thophile Thor called Courbet a "doctor of society" specifically because of the restorative, even recuperative, beauty of his landscape pictures. Here is rural France, with its indecisive mood and its positive spirit, its simple language, its gentle passions, its unemphatic style, its thoughts more down to earth than in the clouds, its mores as far removed from democracy as from demagoguery, its decided preference for the common ways, far distant from all idealist exaltation, happy when it can preserve its honest mondanity under a temperate authority (quoted in J. Rubin, Realism and Social Vision in Courbet and Proudhon, Princeton, 1980, p. 70). The harmony of the composition and the integration of the village with the surrounding countryside represent an ideal in which nature and civilization are in balance, not conflict; nature embraces and protects man. In the 1850s and 1860s Courbet made numerous pictures depicting small villages nestled among the limestone ridges of the Jura plateau (fig. 2). Unmistakably, these pictures form a special category of his landscape paintings. Of these pictures, the present work is the most perfect expression of his ideals. A photograph of Ornans taken in 1949 (fig. 3) reveals the accuracy of Courbet's descriptive powers. Every feature of the buildings in the photograph appears as well in the present work. The minor differences in the lay of the land in the background are due to the slight modification in vantage point between the two images. Look for the darkest tone in the picture you want to paint; when you've found it, mark the place and apply this tone there with a palette knife or bristle brush; probably no detail will be visible within this dark area. Then gradually go into the less dense, intermediate tones, trying to put them where they belong, then, likewise with the halftones. Finally, all you have to do is bring out the highlights, of which there should be fewer than the Romantics are wont to use. Your work will light up at one stroke, once you've got the knack of it; the chance lights will just fall into place... I do what light does, I just brighten the projecting points and the painting gels (quoted in K. Herding, Courbet: To Venture Independence, New Haven and London, p. 114). When Vue d'Ornans et son clocher was first rediscovered in the late 1940s, it was assigned the date of circa 1858, on the basis of its similarity to other landscape pictures of this period. A date in the late 1850s has been endorsed by numerous authorities, including Alfred Daber and Douglas Cooper; and this was the date assigned the painting both in the great 1977-1978 retrospective at the Grand Palais and the Royal Academy, as well as in the major 1988 exhibition at The Brooklyn Museum and the Minneapolis Institute of Arts. On the other hand, Robert Fernier, the author of the 1978 catalogue raisonn dates the picture 1872, and says it was made during Courbet's stopover in Ornans on his way to exile in Switzerland. In early summer of 1858 Courbet wrote to his father, "In France, Belgium and Germany [my paintings] have met with the greatest success that paintings can have and everywhere they are saying that nobody has ever painted like that, not even the ancients" (G. Courbet, The Letters of Gustave Courbet, Chicago and London, 1992, p. 158). The present work, probably painted at about the same time, gives evidence for the truth of this statement. (fig. 1) Gustave Courbet, L'Atelier, 1855 (detail). (fig. 2) Gustave Courbet, Paysage rocheux, environs d'Ornans, circa 1855. (fig. 3) Photograph of Ornans, 1949.